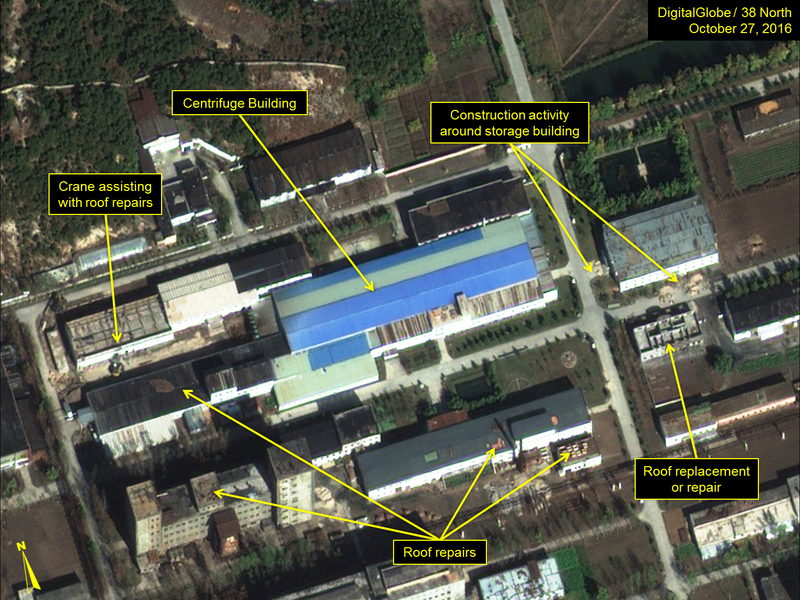 Commercial satellite imagery collected from October 2016 through January 2017 indicates that Pyongyang’s campaign to reprocess plutonium wound down at the end of last year and that the North may now be preparing to resume operations at the 5 MWe plutonium production reactor, which ceased operations in late-2015. 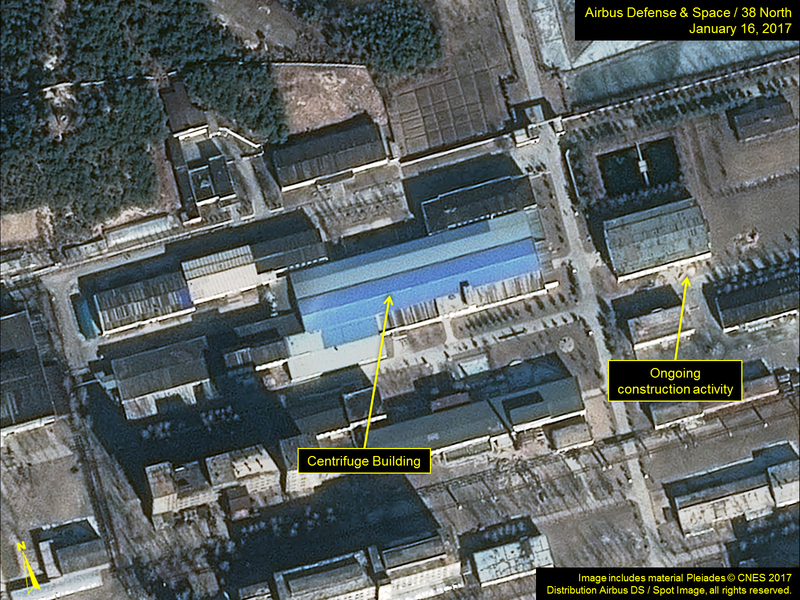 Stepped-up activities throughout the Yongbyon Nuclear Scientific Research Center indicate that it is operating at a level somewhat above what has been observed during the past five years and that may continue into the future. 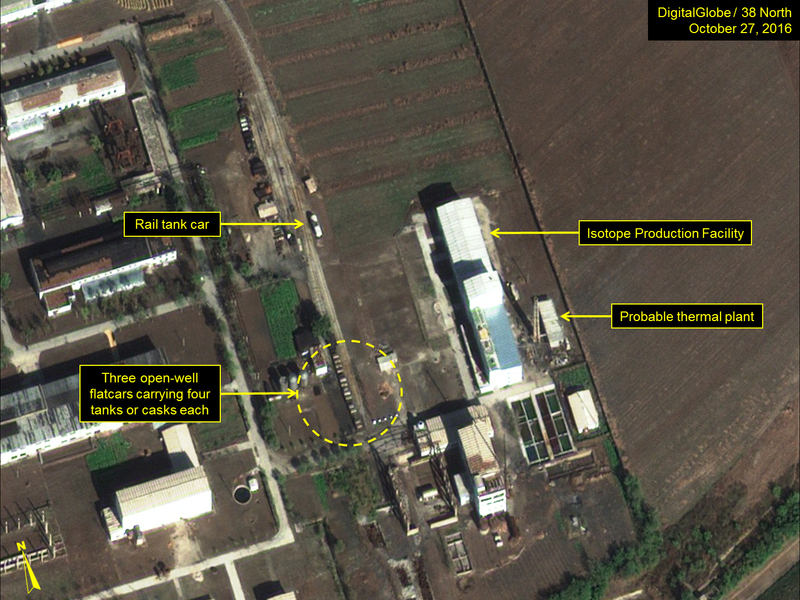 The exact implications of that activity remain unclear except to reaffirm that the Yongbyon facility remains the center of North Korea’s nuclear program. 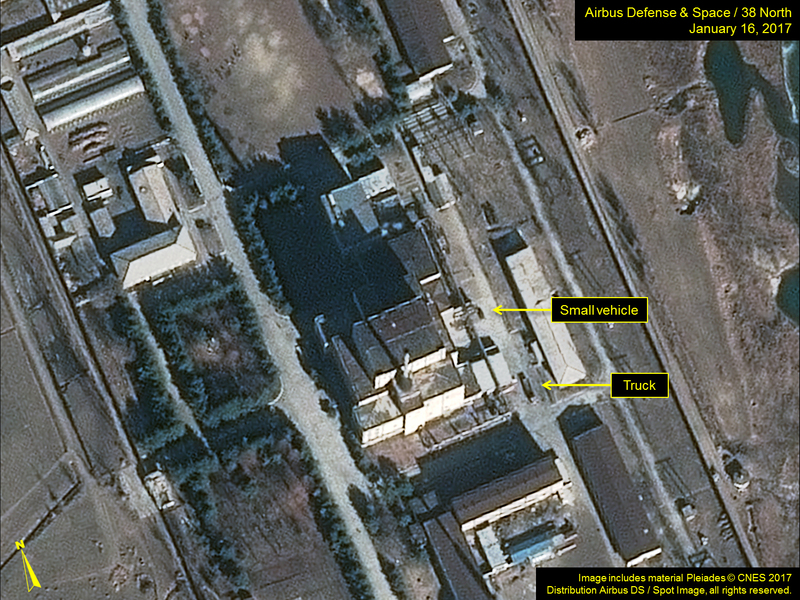 Commercial satellite imagery indicates that North Korea may be preparing to resume operations at its 5 MWe reactor, which had been suspended since late-2015. Throughout the previous four months, there has been a continued presence of vehicles at and around the 5 MWe reactor suggesting either ongoing maintenance, refueling or preparations for renewed operations. 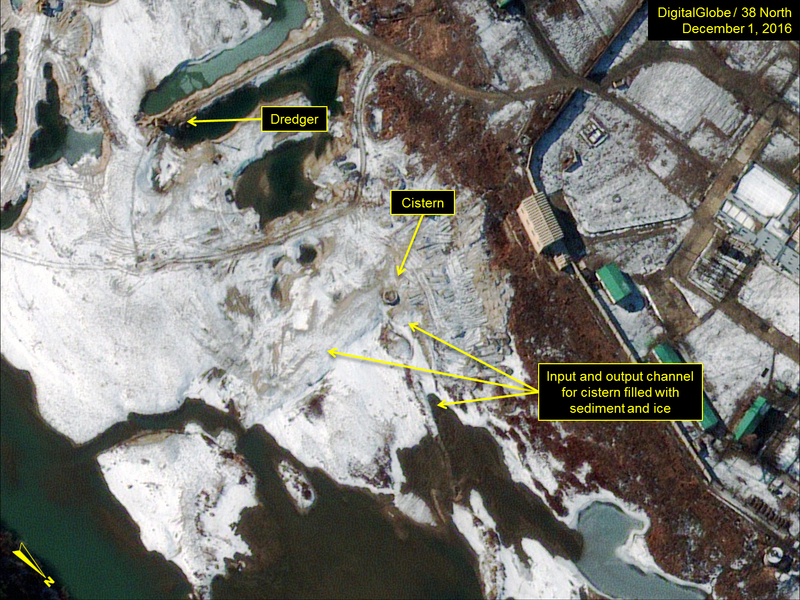 Concurrently, while no steam exhaust was observed at the 5 MWe reactor or its support buildings in any imagery from October through January, the channel in the Taeryong River leading to and from the reactor’s cooling cisterns was cleared of ice and dredged between December 1 and 29. This channel remains clear as of January 16, although no water discharge is observed. 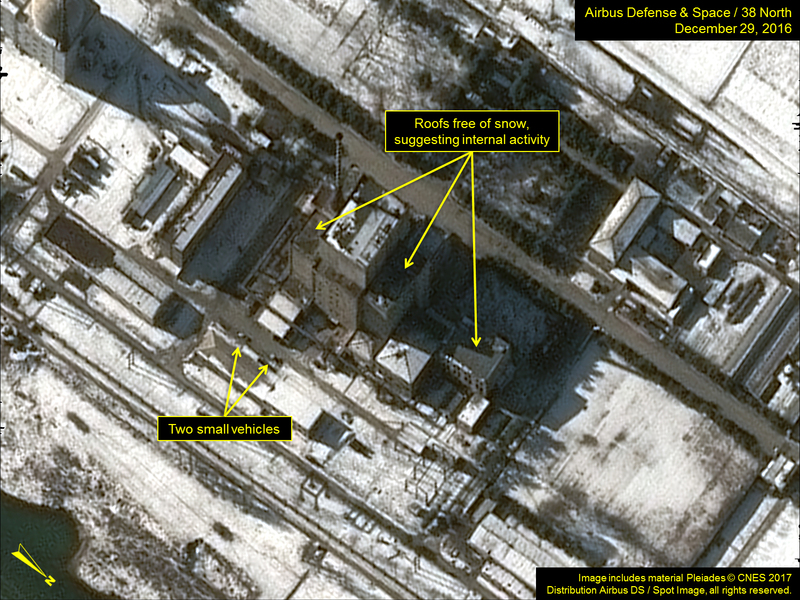 Additionally, no snow was observed on the roofs of the 5 MWe reactor or its support buildings in imagery from December 29, but there was snow on the roofs of other buildings in this area. 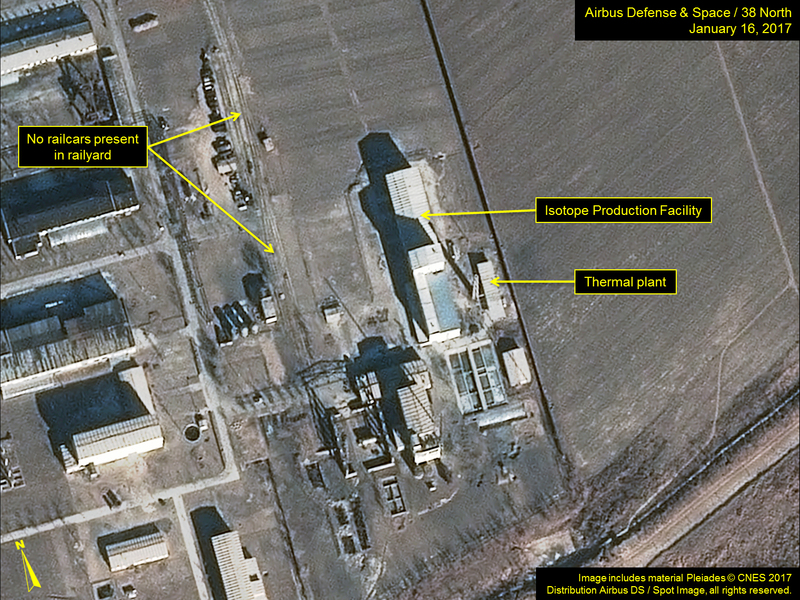 This indicates that the 5 MWe reactor and its support buildings are occupied and at least minimally heated. 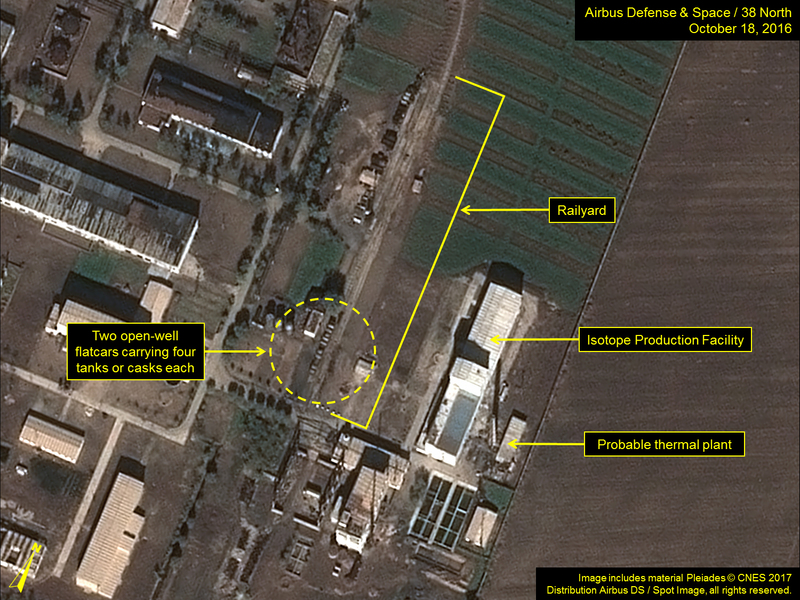 Taken as a whole, these activities suggest preparations to resume operation of the 5 MWe reactor. Figure 1. Channel for 5 MWe reactor’s cooling cistern cleared of ice and dredged in December. Figure 1A. Channel for 5 MWe reactor’s cooling cistern cleared of ice and dredged in December. Figure 1B. Channel for 5 MWe reactor’s cooling cistern cleared of ice and dredged in December. Figure 1C. Channel for 5 MWe reactor’s cooling cistern cleared of ice and dredged in December. Figure 2. Snow-free roofs and continued presence of vehicles suggest ongoing maintenance or operation prep at the 5 MWe Reactor. Figure 2A. Open-well flatcars observed at the vicinity of the Isotope Production Facility in October and moved out of the area in mid-November. Figure 2B. Open-well flatcars observed at the vicinity of the Isotope Production Facility in October and moved out of the area in mid-November. They may also be used to transport materials for some processes related to operations within the Uranium Enrichment Plant. Figure 3. Open-well flatcars observed at the vicinity of the Isotope Production Facility in October and moved out of the area in mid-November. Figure 3A (close-up). Open-well flatcars observed at the vicinity of the Isotope Production Facility in October and moved out of the area in mid-November. Figure 3B. Open-well flatcars observed at the vicinity of the Isotope Production Facility in October and moved out of the area in mid-November. Figure 3B (close-up). Open-well flatcars observed at the vicinity of the Isotope Production Facility in October and moved out of the area in mid-November. Figure 3C. Open-well flatcars observed at the vicinity of the Isotope Production Facility in October and moved out of the area in mid-November. Figure 3D. Open-well flatcars observed at the vicinity of the Isotope Production Facility in October and moved out of the area in mid-November. 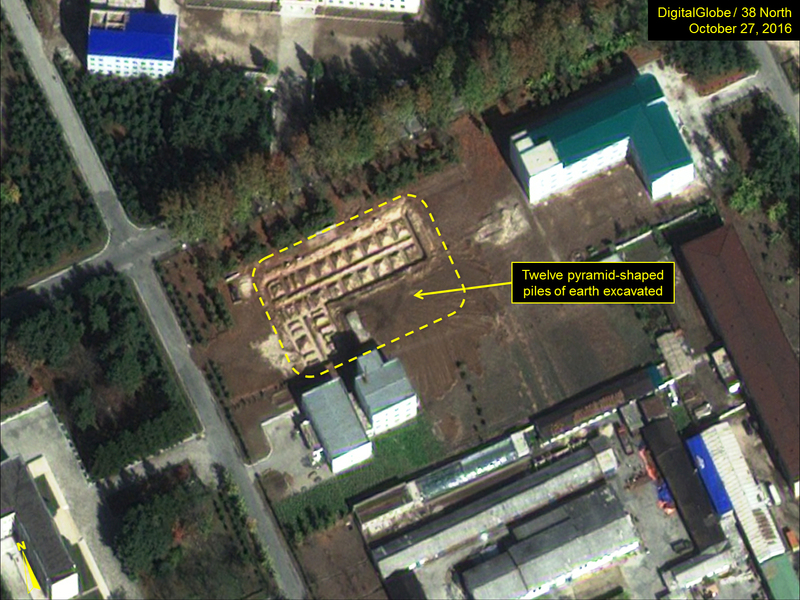 Imagery from late October 2016 indicates a new foundation at an area south and southeast of the IRT Research Reactor containing 12 five-meter-by-five-meter square pyramid-shaped piles of earth. 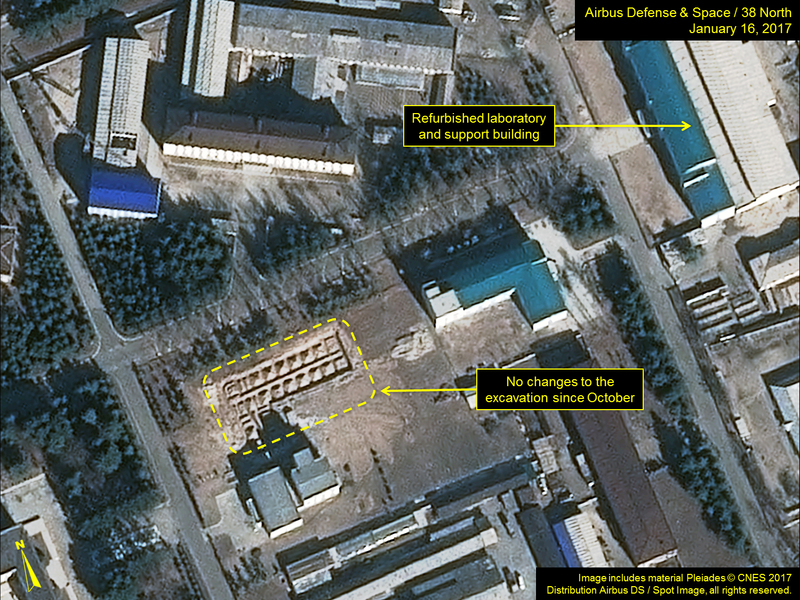 The work is not typical of construction practices in North Korea and the size and shape of these “pyramids” is similar to those seen in the test cell adjacent to the test stand at the Sinpo South Shipyard during 2014-2015 where static tests for the KN-11 submarine-launched ballistic missile have been conducted. While this coincidence is likely to be circumstantial and no specific purpose or correlation with the Sinpo location can be presently attributed to the similarity, it is noteworthy. No significant changes have been made to this excavation through January 2017 and its purpose remains unknown. Overlapping the new excavation was the extensive refurbishment of an old laboratory and support building, approximately 200 meters east, during the second half of 2016. The precise function of this refurbished laboratory and support building is unknown and no direct correlation can be presently made between it and the new excavation. Figure 4. Pyramid-shaped piles of earth excavated in October, but no significant changes since. Figure 4A. Pyramid-shaped piles of earth excavated in October, but no significant changes since. Figure 4B. Pyramid-shaped piles of earth excavated in October, but no significant changes since. While the specialized railroad flatcars noted above were observed at the Radiochemical Laboratory in the past, no railcars of any type were observed at the laboratory facility during October through January. Additionally, since October 2016, no exhaust plume has been observed emanating from the chimney at the Radiochemical Laboratory’s thermal plant. Coal supplies stored in pens at the facility dropped slightly in October and November, suggesting a need to supply heat to the Radiochemical Laboratory. But this requirement has decreased from that noted in May and September when the reprocessing campaign and its subsequent clean-up are presumed to have taken place. 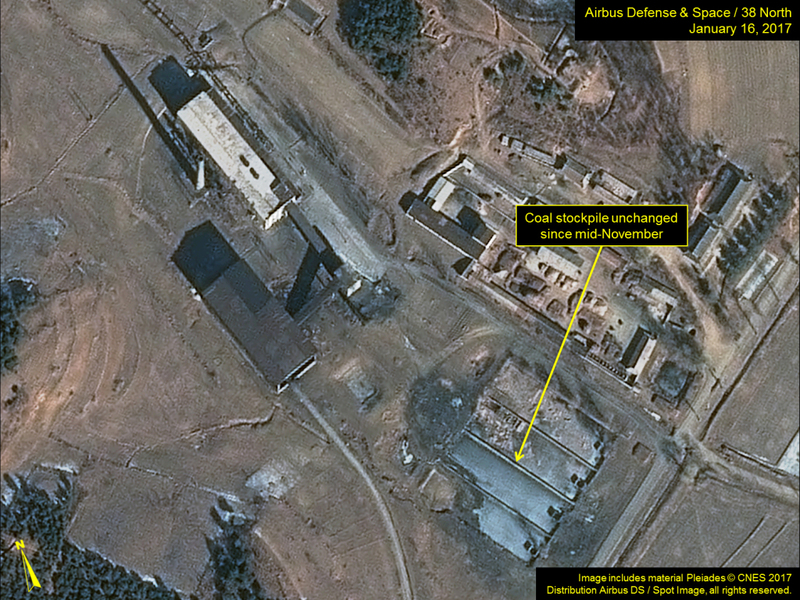 No change in coal stockpiles has been observed since mid-November. Figure 5. Coal stockpile levels in storage pens at the Radiochemical Laboratory have not changed since mid-November. 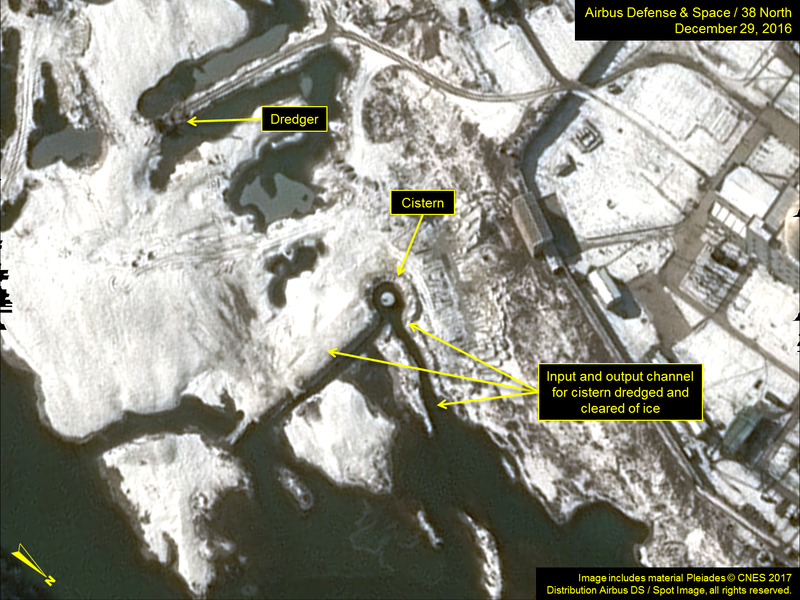 Imagery from December 29 shows that snow previously seen on most buildings in this area has melted off the Centrifuge Building (Uranium Enrichment Plant) and many of its support buildings indicating that it is occupied and likely operating. 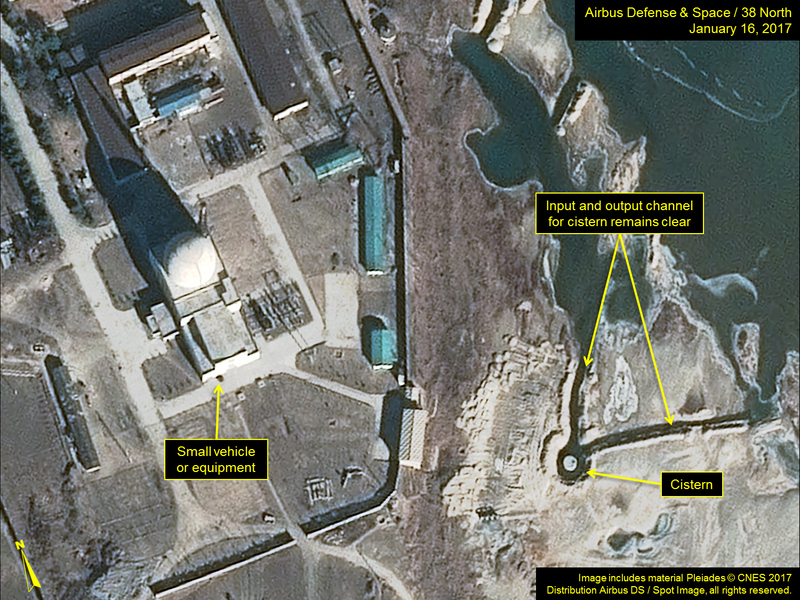 Imagery alone cannot determine whether that means the further production of enriched uranium or other type of activity. Otherwise, little activity has been viewed in past months. Figure 6. Centrifuge Building and support buildings at the Uranium Enrichment Complex appear to be in operation. Figure 6A. Centrifuge Building and support buildings at the Uranium Enrichment Complex appear to be in operation. Figure 6B. 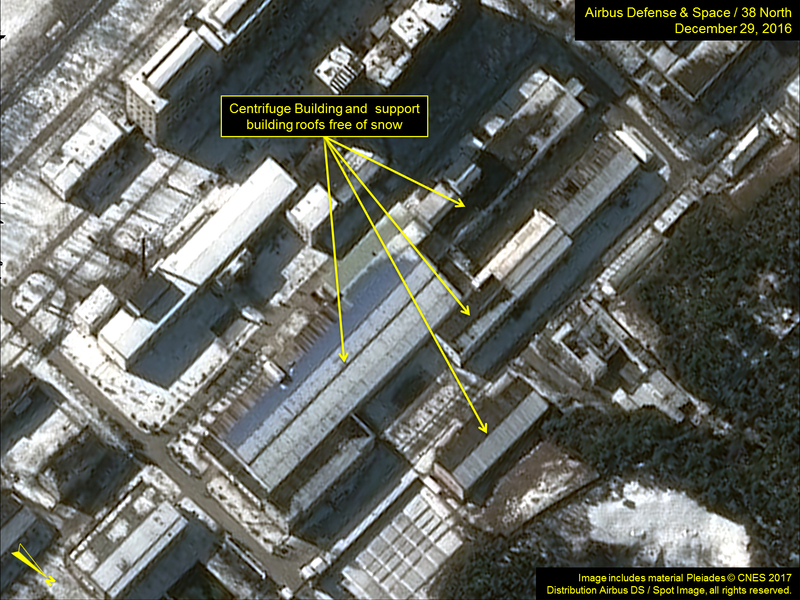 Centrifuge Building and support buildings at the Uranium Enrichment Complex appear to be in operation. Throughout this same period, several vehicles or pieces of equipment have been observed at and around the experimental light water reactor (ELWR), suggesting the continued installation of equipment or maintenance. The imagery, however, provides no indications if or when the North will commence operations this reactor. It should be noted that the measurement of 14-meter-long rail flatcars is approximate and while these are likely open-center rail cars they could also be depressed center railcars. 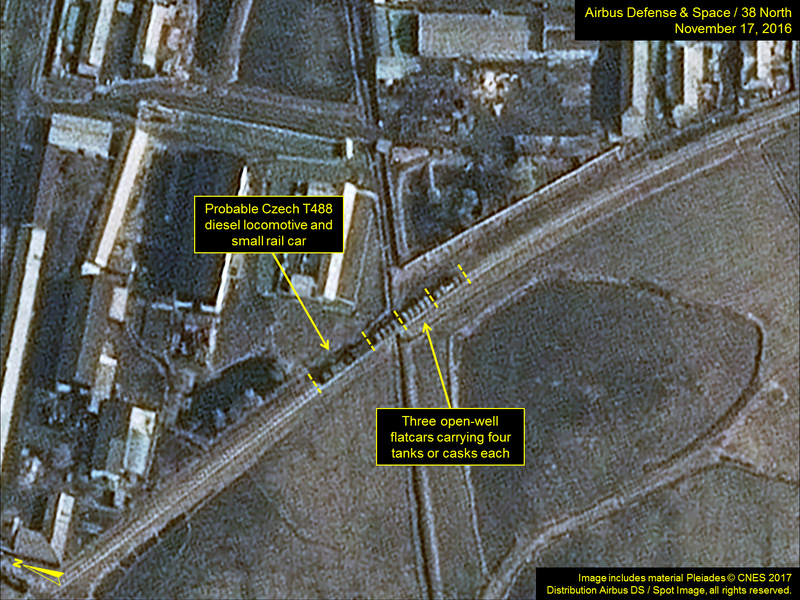 Both open-center and depressed-center flatcars are not common on North Korea’s rail network. These railcars could potentially be useful in supporting future operations at the Isotope Production Facility. 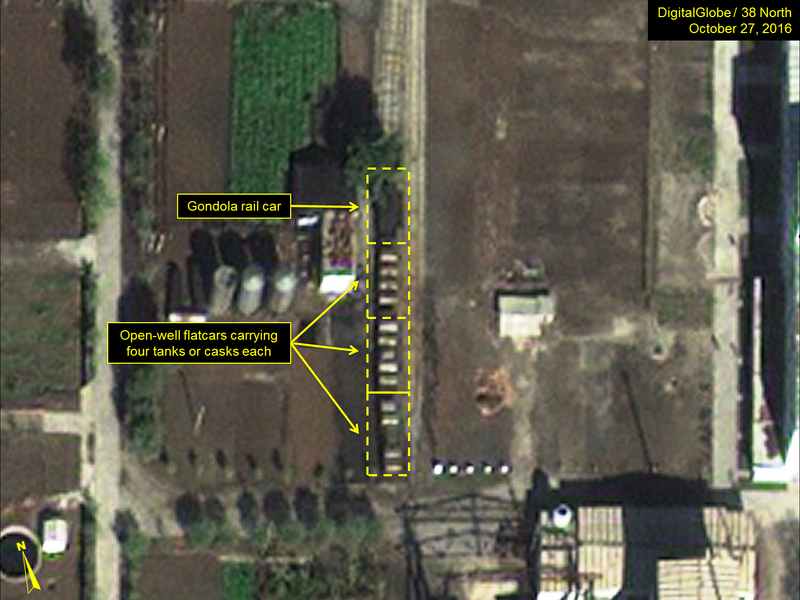 Tank cars of the type observed here on October 18 and 27, 2016 are typically used to transport chemicals or fuel. The presence of a gondola with the open-center flatcars could be an indication that the flatcars are about to be moved. It is standard railroad practice to place “buffer” or “spacer” cars before and after cars carrying highly toxic or fragile cargo when moving them. 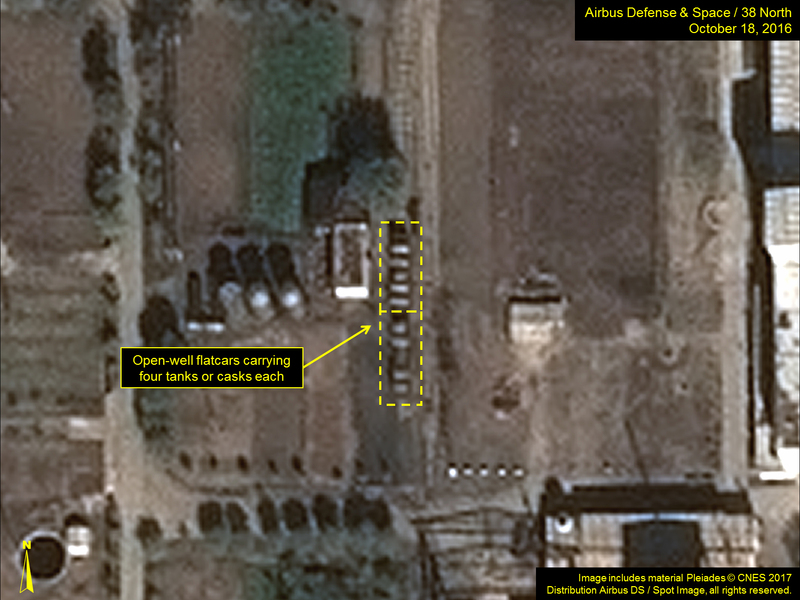 Joseph S. Bermudez Jr., “North Korea: Test Stand for Vertical Launch of Sea-Based Ballistic Missiles Spotted,” 38 North, October 28, 2014, https://www.38north.org/2014/10/jbermudez102814/.